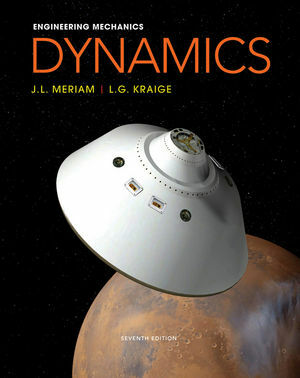 Known for its accuracy, clarity, and dependability, Meriam & Kraige's Engineering Mechanics: Dynamics has provided a solid foundation of mechanics principles for more than 60 years. Now in its seventh edition, the text continues to help students develop their problem-solving skills with an extensive variety of engaging problems related to engineering design. More than 50% of the homework problems are new, and there are also a number of new sample problems. To help students build necessary visualization and problem-solving skills, the text strongly emphasizes drawing free-body diagrams-the most important skill needed to solve mechanics problems. 2.5 Normal and Tangential Coordinates (n-t). 4.2 Generalized Newton's Second Law. 6.7 Acceleration from Work-Energy; Virtual Work. Chapter 7: Introduction to Three-Dimensional Dynamics of Rigid Bodies. C.11 Newton's Method for Solving Intractable Equations. Approximately 40 percent of the homework problems are new to this seventh edition. All new problems have been independently solved in order to ensure a high degree of accuracy. New Sample Problems have been added, including problems with computer-oriented solutions. Ø Introductory Problems are simple, uncomplicated problems designed to help students gain confidence with a new topic. These appear in the problem sets following the Sample Problems. Ø Representative Problems are more challenging than Introductory Problems but are of average difficulty and length. These appear in the problem sets following the Sample Problems. Ø Computer-Oriented Problems are marked with an icon and appear in the end-of-chapter Review Problems. Ø Review Problems appear at the end of chapter. Offers comprehensive coverage of how to draw free body diagrams. Through text discussion and assignable homework problems, students will learn that drawing free body diagrams is the most important skill needed to learn how to solve mechanics problems. Meriam and Kraige teaches students the appropriate techniques and then applies them consistently in solutions of mechanics problems. SI Units are covered. There are approximately two problems in SI units for every problem in U.S. customary units.